It is always exciting to discover real-life heroes you never heard of before, especially when the hero is a cross-dresser, impersonator, nurse, Civil War soldier, and spy all rolled into one—and he just happens to be a she! Who is that bigger-than-life hero? 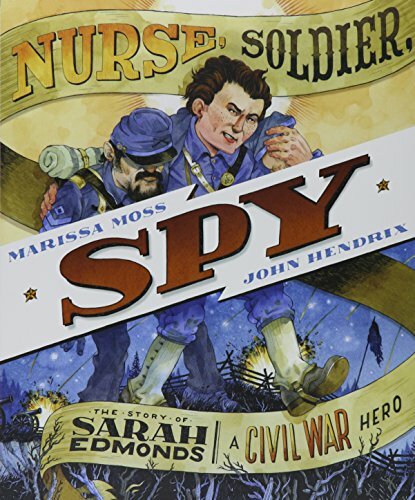 His name is Sarah Edmonds, and his story is told in a picture book called Nurse, Soldier, Spy: The Sarah Edmonds Story, A Civil War Hero by Marissa Moss. Nurse, Soldier, Spy is the true tale of a rebellious young lady named Sarah Edmonds who runs away from home to avoid an arranged marriage and ends up enlisting as a Union soldier in the Civil War. Under the assumed name of Frank Thompson, Sarah trains as a soldier and a nurse, sleeps in a tent full of fellow male soldiers, and even pulls wounded men off the battlefield. After a spy is killed in the line of duty, Sarah answers the call to act as a spy and sheds her soldier’s uniform. She transforms herself into a free black, complete with curly wig, and manages to infiltrate the enemy’s camp. She accomplishes that particular spying mission and several more afterward, meeting and helping ex-slaves and making lists of enemy fortifications and maps of where their guns are located along the way. Nurse, Soldier, Spy is an edge-of-your-seat, don’t-blink-or-you’ll-miss-it book with lively prose that manages to detail Sarah’s riveting adventures without boring the reader one little bit. Artist John Hendrix’s illustrations are urgent, bright, and over-the-top bold, offering brilliantly detailed scenes of Civil War battlefields, hospital life, and lonely soldiers’ tents underneath the starry skies. There is an Author’s Note in the back that offers as much exciting details about the rest of Sarah’s life as the book itself. There is also a great Artist’s Note that explains Mr. Hendrix’s philosophy on the marriage between clarity and poetry (images and text), including what he researched before he started his illustrations and what he learned in the process. And for the lifelong learner there is a detailed glossary in the back, plus the author’s and artist’s bibliographies for further reading.